Having enjoyed success in previous camp seasons by using popular children's stories and author's, Melissa Teacher opted to create a camp which would focus on the works of Dr. Seuss. The camp had a small focus on rhyming as well as various aspects of stories such as The Cat in the Hat, Ten Apples up on Top, One Fish, Two Fish, Red Fish, Blue Fish and of course Green Eggs and Ham. While Melissa teacher focused on the use of stories to teach prepositions, free time activities, likes and dislikes and comparisons, the Korean co-teacher conveniently provided movie watching opportunities as well as cooking classes. The previous camp season, students learned to make hamburgers and kimbap. 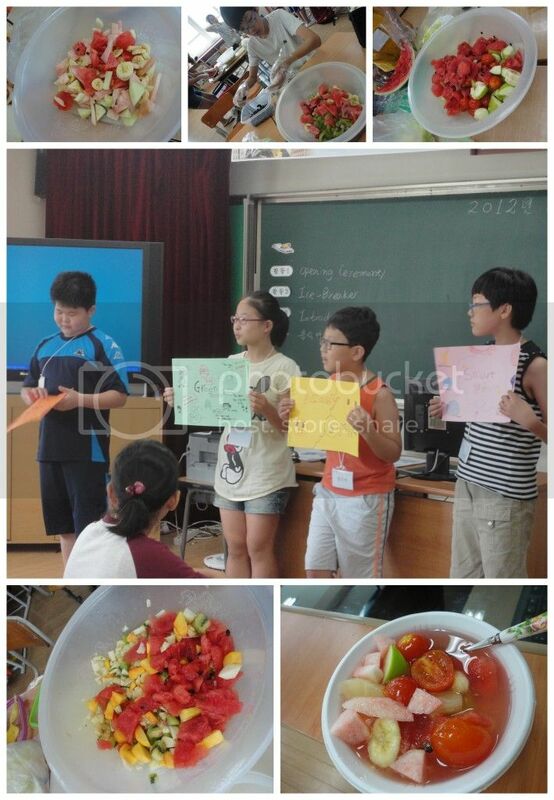 This camp season students again made and enjoyed kimbap as well as fruit punch. However, this fruit punch was not exactly what Melissa Teacher would have imagined a fruit punch to be. Filled with chopped fruit including bananas, un-ripe peaches, kiwi, apples, grapes and even tomatoes the liquid portion of the 'punch' was a watered down combination of lemon-lime soda and pineapple soda. Needless to say, the fruit punch from summer camp 2012 is not among the recipes Melissa Teacher feels a deep need to recreate anytime soon...or ever for that matter. The few days Melissa Teacher spent with her camp students were her final days at Samcheon Elementary school. A better way to end her teaching days in South Korea than the regular semester had provided yet still not an entirely difficult position to leave with the taste of hard peaches, tomatoes and sprite fresh on the tongue.